Ketamine appears to restore faulty connections between brain cells, according to research performed in mice. The anesthetic ketamine can relieve depression in hours and keep it at bay for a week or more. Now scientists have found hints about how ketamine works in the brain. In mice, the drug appears to quickly improve the functioning of certain brain circuits involved in mood, an international team reported Thursday in the journal Science. Then, hours later, it begins to restore faulty connections between cells in these circuits. The finding comes after the Food and Drug Administration in March approved Spravato, a nasal spray that is the first antidepressant based on ketamine. The anesthetic version of ketamine has already been used to treat thousands of people with depression. But scientists have known relatively little about how ketamine and similar drugs affect brain circuits. The study offers "a substantial breakthrough" in scientists' understanding, says Anna Beyeler, a neuroscientist at INSERM, the French equivalent of the National Institutes of Health, who wasn't involved in the research. But there are still many remaining questions, she says. Previous research has found evidence that ketamine was creating new synapses, the connections between brain cells. But the new study appears to add important details about how and when these new synapses affect brain circuits, says Ronald Duman, a professor of psychiatry and neuroscience at Yale University. Studying ketamine's antidepressant effects in mice presented a challenge. "There's probably no such thing as a depressed mouse," says Dr. Conor Liston, a neuroscientist and psychiatrist at Weill Cornell Medicine in New York and an author of the Science paper. So Liston and a team of scientists from the U.S. and Japan gave mice a stress hormone that caused them to act depressed. For example, the animals lost interest in favorite activities like eating sugar and exploring a maze. Then the team used a special laser microscope to study the animals' brains. The researchers were looking for changes to synapses. "Stress is associated with a loss of synapses in this region of the brain that we think is important in depression," Liston says. And sure enough, the stressed-out mice lost a lot of synapses. Next, the scientists gave the animals a dose of ketamine. And Liston says that's when they noticed something surprising. "Ketamine was actually restoring many of the exact same synapses in their exact same configuration that existed before the animal was exposed to chronic stress," he says. In other words, the drug seemed to be repairing brain circuits that had been damaged by stress. That finding suggested one way that ketamine could be relieving depression in people. But it didn't explain how ketamine could work so quickly. Was the drug really creating all these new synapses in just a couple of hours? To find out, the team used a technology that makes living brain cells glow under a microscope. "You can kind of imagine Van Gogh's Starry Night," Liston says. "The brain cells light up when they become active and become dimmer when they become inactive." That allowed the team to identify brain circuits by looking for groups of brain cells that lit up together. And that's when the scientists got another surprise. After the mice got ketamine, it took less than six hours for the brain circuits damaged by stress to begin working better. The mice also stopped acting depressed in this time period. But both of these changes took place long before the drug was able to restore many synapses. "It wasn't until 12 hours after ketamine treatment that we really saw a big increase in the formation of new connections between neurons," Liston says. The research suggests that ketamine triggers a two-step process that relieves depression. First, the drug somehow coaxes faulty brain circuits to function better temporarily. Then it provides a longer-term fix by restoring the synaptic connections between cells in a circuit. One possibility is that the synapses are restored spontaneously once the cells in a circuit begin firing in a synchronized fashion, says INSERM'S Beyeler, who wrote a commentary accompanying the study. The new study suggests not only how ketamine works but also why its effects typically wear off after a few days or weeks, she says. "What we can imagine is that ketamine always has this short-term antidepressant effect, but then if the synaptic changes are not maintained, you will have relapse," Beyeler says. If that's true, she says, scientists' next challenge is to find a way to maintain the brain circuits that ketamine has restored. 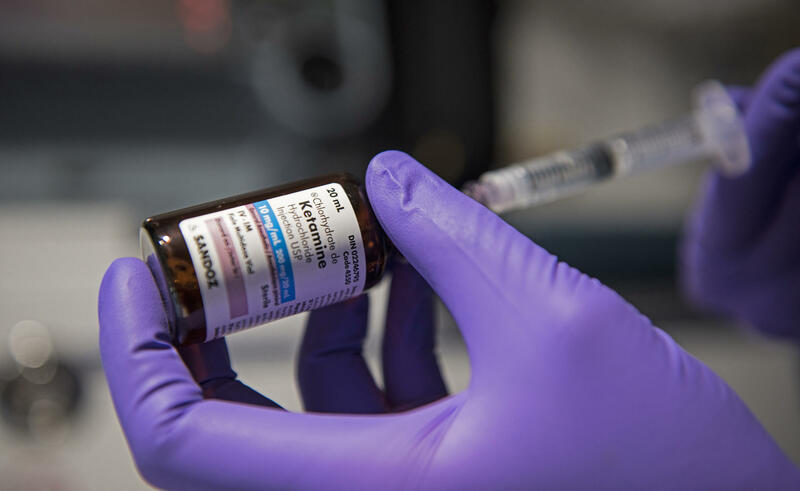 The anesthetic ketamine can relieve severe depression in a matter of hours. And in March, the Food and Drug Administration approved the first antidepressant based on ketamine. But scientists still have a lot of questions about how this drug works in the brain. NPR's Jon Hamilton reports on research that may offer some answers. JON HAMILTON, BYLINE: The research involved mice, and Dr. Conor Liston of Weill Cornell Medicine in New York says that presented a challenge. CONOR LISTON: There's probably no such thing as a depressed mouse. HAMILTON: So Liston and a team of scientists gave mice a stress hormone that made them act depressed. They lost interest in favorite activities like eating sugar and exploring a maze. Then the team used a special microscope to study the animal's brains. Liston says they were looking for changes to synapses, the connections between brain cells. LISTON: Stress is associated with a loss of synapses in this region of the brain that we think is important in depression. HAMILTON: And sure enough, the stressed out mice had lost a lot of synapses in that region. Next, the scientists gave the animals a dose of ketamine. Liston says that's when they noticed something remarkable. LISTON: Ketamine was actually restoring many of the exact same synapses in their exact same configuration that existed before the animal was exposed to chronic stress. HAMILTON: In other words, the drug seemed to be repairing the same brain circuits damaged by stress. That finding suggested at least one way that ketamine could be relieving depression in people, but it didn't explain how ketamine could work so quickly. Was the drug really creating all these new synapses in just a couple of hours? To find out, Liston says, the team used a technology that makes living brain cells glow under a microscope. LISTON: You can kind of imagine like Van Gogh's "Starry Night," and the brain cells light up when they become active and become dimmer when they become inactive. HAMILTON: That let the team identify specific brain circuits by looking for groups of brain cells that lit up together. And that's when the scientists got another surprise. After the mice got ketamine, the faulty brain circuits started working better in less than six hours. The animals also stopped acting depressed. But Liston says both of these changes took place long before the drug was able to restore many synapses. LISTON: It wasn't until 12 hours after ketamine treatments that we really saw a big increase in the formation of new connections between neurons. HAMILTON: The research appears in the journal Science, and it suggests that ketamine triggers a two-step process to treat depression. First, it somehow coaxes faulty brain circuits to function better temporarily. Then it provides a longer-term fix by restoring the synapses that connect cells in a circuit. Anna Beyeler of the University of Bordeaux wrote a commentary accompanying the study. She says the findings suggest not only how ketamine works, but also why its effects typically wear off after a few days or weeks. ANNA BEYELER: What we can imagine is that ketamine always has this short-term antidepressant effect, but then if the synaptic changes are not maintained, you will have relapse. HAMILTON: Beyeler says, if that's true, the next challenge is to find a way to maintain the brain circuits that ketamine has restored. Jon Hamilton, NPR News. Transcript provided by NPR, Copyright NPR.